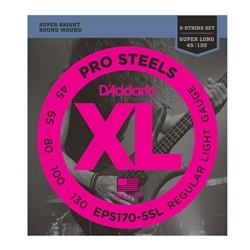 EPS170-5SL is the Super Long 5-string version of D'Addario's best-selling ProSteels bass set. With the addition of the .130 low B string, EPS170-5SL offers the ideal combination of biting high end, punchy lows and super long life. Fits super long scale basses with a string scale length of up to 38 inches.